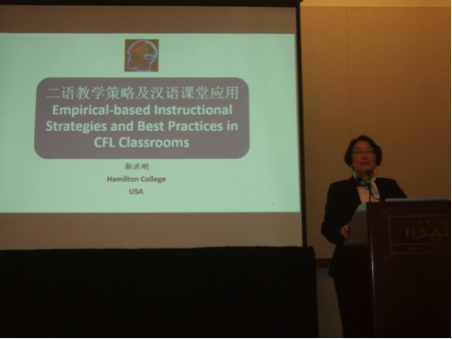 The Chinese Language Teachers Association, USA (CLTA) successfully held its 2014 annual conference in conjunction with the American Council on the Teaching of Foreign Languages (ACTFL) in San Antonio, TX from Nov. 21-23, 2014, with the theme of “Reaching Global Competence.” This (inter)national event brought together hundreds of Chinese language educators from around the country and attracted a number of international attendants. A dozen publishers and vendors exhibited their recent publications and showcased their services related to Chinese teaching and learning. This year, the conference featured 70 panels, 11 roundtable discussions, and 4 poster sessions. About 250 presenters shared their research findings and teaching experiences, and discussed issues and challenges relating to teaching and learning Chinese as a second language at different levels. A variety of topics were covered, ranging from classroom research, curriculum design, syllabus development, technology-assisted teaching, articulations between high schools and universities, language policies, study abroad, to textbook development, to name just a few. Almost all the panels were well attended and followed by engaging discussions. In addition, two workshops were offered with more than 60 participants for each on the topics that were particularly attractive to our new/young members: “Empirically-based Instructional Strategies and Best Practices in CFL Classrooms” by Prof. Jin Hong Gang and “Teaching Chinese with Technology” by Professors Phyllis Zhang, Tianwei Xie and Jun Da. As in past years, CLTA set up a special booth hosting the event of meeting-with-authors in which some recent publications authored by our members were displayed. 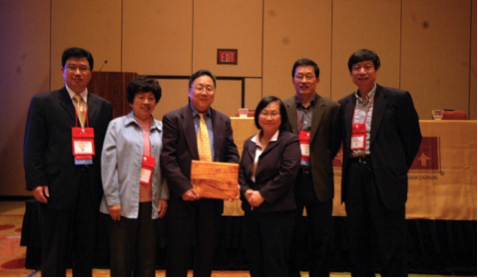 Professor Emeritus Tianwei Xie of the California State University, Long Beach, received this year’s Walton Lifetime Achievement Award for his years of outstanding service as a Chinese educator in general and invaluable contributions in the area of technology-assisted teaching in Chinese language instruction in particular. Congratulations and Happy Retirement, Professor Xie! 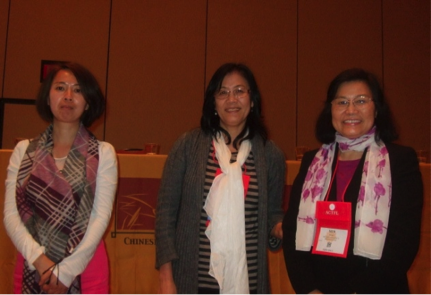 One achievement that drew our warm applause is the success of the First International Symposium on Chinese Language Teaching and Learning held at Indiana University – Bloomington in October 2014. According to Yea-Fen Chen, Chair of the symposium’s organizing committee, there were about 300 scholars and Chinese instructors from a number of countries coming to the symposium, which truly was “international”. Prof. Tao extended special thanks to everyone who made it a great success and announced that the second symposium will be held at the University of Maryland in 2016 with the exact dates to be determined. Thanks to the generosity of our donors and timeless efforts of the Fund-Raising Committee, this year the Association received the donations in the amount of $11,832 from 11 agencies, publishers, vendors, institutes and individuals as of Nov. 1, 2014, which enables us to establish some new awards and grants to our outstanding individual members and affiliated regional associations. The association’s name was changed from the “Chinese Language Teachers Association” to the “Chinese Language Teachers Association, USA” with the Chinese name from中文教师学会 to 美国中文教师学会. This change was endorsed by the majority of the members with about 90% saying yes according to an electronic ballot. Likewise, about 95% members who voted supported the initiative to design an official logo for the Association. For this purpose, a competition will be launched among the members. Starting from 2016, the CLTA’s journal will be published by John Benjamins. The name of the journal is suggested to be changed from the Journal of the Chinese Language Teachers Association (JCLTA) to Chinese as a Second Language — the Journal of the Chinese Language Teachers Association, USA, and its Chinese name is still under discussion. These name changes will be subject to the approval by a majority vote of general members. A new on-line journal will be launched in 2015, focusing on publishing articles about K-L2 Chinese teaching. There are several changes in the leadership of the Association. Yea-Fen Chen of Indiana University will step down at the end of 2014 as the Executive Director after years of whole-hearted dedication and hard-working commitment, and Prof. John Jinghua Yin of the University of Vermont will take over the task. Prof. Yin’s duty as the newsletter editor is handed over to Prof. Zhuo Jing-Schmidt of the University of Oregon. The membership meeting bid farewell to the 4 retired board members who had been working diligently for our members during the past three years. 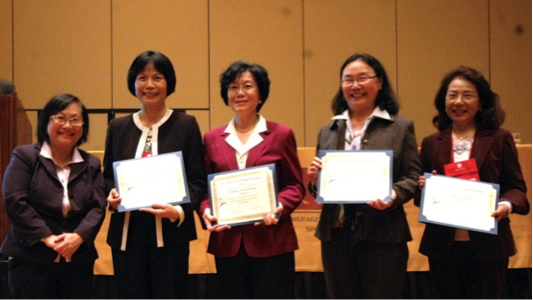 They are Professors Der-lin Chao, Jane Kuo, Miao-fen Tseng, and Phyllis Zhang. The meeting also welcomed 5 newly elected members including Professors Wayne Wenchao He, Nan Jiang, Jiangling Liao, Yun Xiao, and Fangyuan Yuan. For the year of 2015, Prof. Chengzhi Chu of UC Davis will serve the President of the Association and Prof. Helen Shen of the University of Iowa the Vice President. Altogether there are 12 committees with five new ones. For the names of the 2015 CLTA Board of Directors and officers, please refer to the composition chart at the end of the report. You can also visit our website at http://clta-us.org/ for more details. The Action Research Award was awarded to Binnan Gao of Elon University whose winning project is “Developing Effective Techniques of Correcting First-Year Students’ Pronunciation Errors”. The Cengage Learning Award for Innovative Excellence in the Teaching of Chinese as a Foreign Language. The winners of its first prize are Crista Cornelius, Donglin Chai, and Bing Mu from Ohio State University whose project is “Tiyan rizhi: Maximizing Community-based Learning in Chinese Study Abroad Contexts.” The two recipients of the second prizes are Shijuan Liu from Indiana University of Pennsylvania and Sue-mei Wu from Carnegie Mellon University, with the projects titled “Content-Based Instruction With Emerging Technology for A Mixed Level” and “The Chinese Folk Performance Curriculum: Leveraging Technology” respectively. The Cheng & Tsui Professional Development Grant was presented to Carl Polley of the University of Hawai’i Kapi’olani Community College and Ruihua Liu from the Houston Independent School District. The CLTA Study Abroad Site Visit Award recipient is Lan Zhang of the University of Memphis. 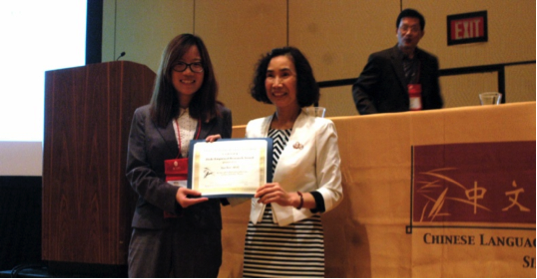 The Walton Presentation Prize was awarded to Yu Wu from Boston University. The CLTA Professional Development Grant was presented to nine regional associations, including the Chinese Language Teachers Association of California, Chinese Language Teachers’ Association of Southern California, Chinese Language Teachers Association of Texas, Chinese Language Teachers Association of Virginia, Chinese Language Teachers Association-Washington State, Georgia Chinese Language Educators, Iowa Chinese Language Teachers Association, Oklahoma Chinese Language Teachers Association, and Wisconsin Association of Chinese Language Teachers. Prof. Chengzhi Chu, our 2015 President, concluded the membership meeting with a brief speech. He expressed profound thanks to Prof. Hongyin Tao for his outstanding leadership and dedicated work, and heart-felt appreciations to all the CLTA members for their trust and support. Speaking about the work of 2015, he introduced the functions and responsibilities of the 12 standing and ad hoc committees of the Association and called for member participation in the CLTA Logo design competition, fundraising initiatives, on-line vote for new board members and Vice President, and the Chinese National Honor Society Initiative.